EFE, via 14ymedio, Havana, 30 June 2017 – The average monthly salary in Cuba in 260 was 740 Cuban pesos (CUP), the equivalent of $29.60 in US dollars, although the figure is higher in sectors such as the sugar industry – where the best paid earn 1,246 CUP ($48.80 US), and falls in public administration, defense and social security, with a figure a 510 (CUP) ($20.40 US). The figures come from the publication “Figures for Average Salaries in 2016,” released on Thursday by Cuba’s National Office of Statistics and Information, which includes average monthly salaries by province since 2007, and average monthly salary by economic activity type since 2014. According to the report, the average salary in Cuban increased from 408 CUP ($16.30 US) in 2007 to 740 CUP in 2016. By province, the highest salaries are earned in Ciego de Ávila (816 CUP / $32.60 US), Villa Clara (808 CUP / $32.30 US) and Matanzas (806 CUP / $32.20 US), while the lowest wages are paid in Guantánamo (633 CUP / $25.30 US), Isla de la Juventud (655 CUP / $26.20 US) and Santiago de Cuba (657 CUP / $26.20 US). The highest paid sectors on the island are the sugar industry (1,246 CUP / $49.80 US), mining and quarrying (1,218 CUP / $48.70 US), financial services (1,032 CUP / $41.20 US), and agriculture, livestock, forestry and fisheries (991 CUP / $39.60 US). On the other hand, economic activities with lower wages are: “Other communal services, associations and personal activities,” (503 CUP / $20.10 US); public administration, defense and social security (510 CUP / $20.40 US); Culture and sport (511 CUP / $20.40 US); and education (533 CUP / $21.32 US). 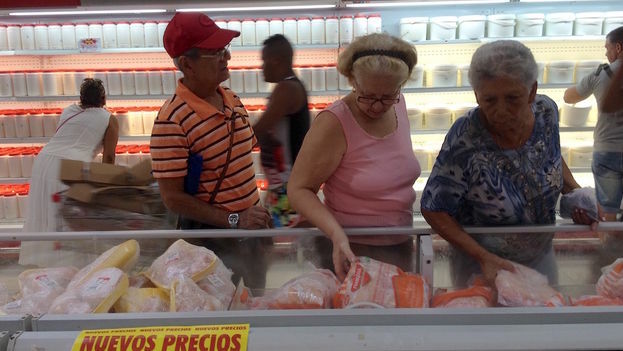 The low wages paid to state employees in Cuba, compared to the high cost of basic products—Cuba imports 80% of its food—are constantly subject to criticism by international organizations and also by opposition movements. But the rationing system, which decades ago covered much of the population’s needs—including underwear, shoes and children’s toys—has been reducing the quantities and types of subsidized products. Currently, an adult Cuban receives monthly from the ration stores about 7 pounds of rice, 4 pounds of sugar, one pint of soybean oil, one packet of mixed coffee (that is coffee mixed with fillers such as dried peas), one packet of pasta, five eggs and small quantities of chicken. Children also get one quart of milk a day until they turn seven. In 2011, Cuban President Raul Castro approved the authorization of new categories of self-employment (the term used in Cuba means “own account-ism”) as one of the key measures to compensate for the progressive reduction of 500,000 jobs in the state sector. Another of the main distortions in the Cuban economy is the simultaneous circulation of two currencies—the Cuban pesos or “national money” and the Cuban convertible peso, or “hard currency”—that the Government recognizes needs to be changed, but for the system remains in force and there is no firm date to merge the currencies.